Remote sensing satellite data have been used to recognize structures having tectonic significance. Based on satellite data, lineament map of Nurpur and its adjoining area of District Kangra, Himachal Pradesh, has been generated. LR-115 solid state nuclear track detectors have been used for the measurement of soil gas radon at 71 different locations of the study area. Radon monitoring in underground water at 26 different locations of the study area has been carried by scintillometry. The results indicate zones of lineament density and tectonically induced radon in soil and underground water. The results are co-relatable with regional geology of the area. The knowledge of distribution of radionuclides and radiation levels in the environment is important for assessing the effects of radiation exposure to human beings. Terrestrial radiation is due to the radionuclides present in different amounts in rocks, soils, building materials, water and atmosphere. Radon is the main natural radiation source of exposure of human beings and has been recognized as a carcinogenic gas. Radium ( 226 Ra) and its ultimate precursor uranium ( 238 U) are the parent sources of radon. 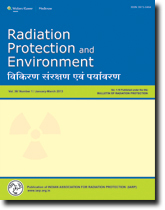 In the present study, radon exhalation rate and radium concentration in soil and rock samples around Chamaraja Nagar area of Karnataka State, India are measured using solid state nuclear track detector's employing "can technique" and LR-115 Type-II detectors. The result from the present investigation shows that radium activity in rock sample varies from 2.9 to 39.5 Bq/kg with a geometric mean of 13.4 Bq/kg. Mass and surface exhalation rate of radon in rock samples varies from 8.0 to 119.7 mBq/kg/h with the geometric mean of 24.8 mBq/kg/h and 93.9-1787.3 mBq/m 2 /h with a geometric mean of 562.5 mBq/m 2 /h respectively. Radium concentration in soil samples has been found to vary from 3.6 to 34.1 Bq/kg with a geometric mean of 14.7 Bq/kg. The mass exhalation rate of radon in soil samples has been found to vary from 10.0 to 31.4 mBq/kg/h with a geometric mean of 18.6 mBq/kg/h. 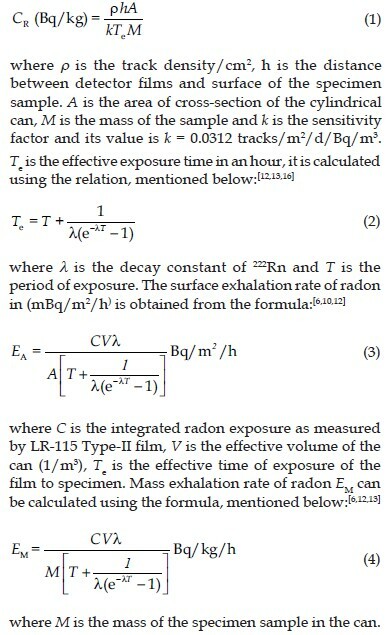 The surface exhalation rate of radon varies from 142 to 918.4 mBq/m 2 /h with a geometric mean of 391.5 mBq/m 2 /h. 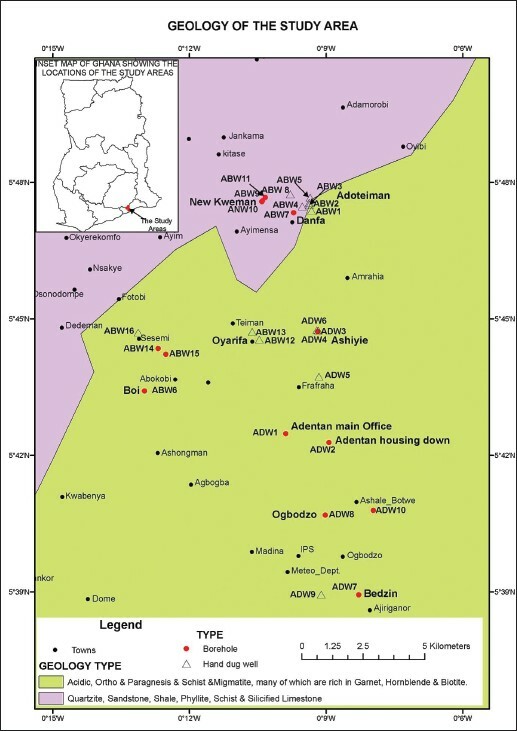 Gross alpha and gross beta in 26 groundwater samples from Adentan to Abokobi areas in the Greater Accra Region of Ghana were determined using Alpha/Beta counting system (Canberra iMatic TM ). The average activity concentrations of gross alpha and gross beta were 0.034 and 0.501 Bq/L for Adentan, and 0.066 and 0.470 Bq/L for Abokobi, respectively. The results obtained are below the guideline levels of gross alpha (0.5 Bq/L) and gross beta (1.0 Bq/L) in drinking water established by the World Health Organisation. These results show that consumption of groundwater for the study areas may not pose any significant radiological health hazards through ingestion to the population. 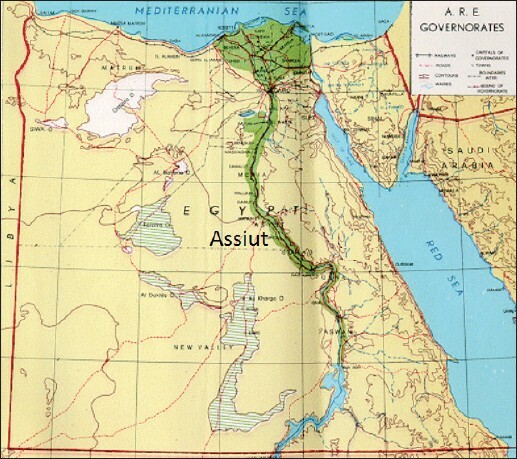 Context: To examine the status of the environmental quality of the soils in Assiut zone in central Upper-Egypt, investigation was carried out to determine the concentration of natural radionuclides (radium [ 226 Ra], thorium [ 232 Th] and 40 K) and the contents of eight heavy metals (Cd, Pb, Ni, Fe, Mn, Cr, Cu, and Zn). Materials and Methods: The measurements of concentration of natural radionuclides were carried out by using the gamma spectrometry (NaI (Tl); 3× 3"). Results: The results indicate that the soil samples' radioactivity concentrations of 226 Ra, 232 Th, and 40 K were ranging from 10.4 ± 0.5 to 19 ± 1 Bq/kg; 6 ± 0.3-21 ± 3 Bq/kg and 103.6 ± 5-221 ± 10 Bq/kg respectively. The typical radiation doses (D o ), the external hazard index (H ex ) and annual effective dose rate values for the corresponding samples were also estimated. 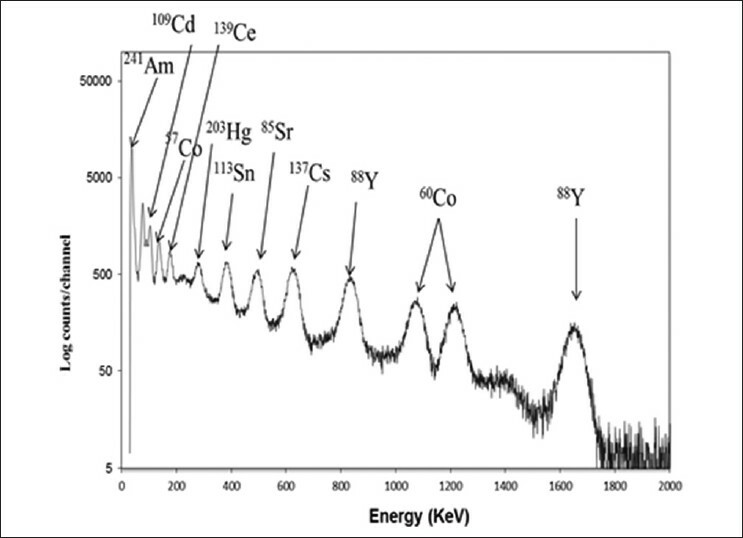 The concentration of heavy metals was measured by using the atomic absorption spectrometry method. Data were analyzed by using the statistical methods. The representative H ex values for the corresponding samples were also estimated. Generally, heavy metals and major elements concentration of the sediments were found decrease in sequence of Fe > Mg > pb > Zn > Cr > Cu > Ni > Cd. In some locations, the concentration for the investigated heavy metals exceeds the permissible limits recommended by the Canadian Environmental Quality Guidelines. The highest concentration of the most heavy metals (Cd, Pb, Ni, Cr, and Zn) was found in Arab Al-Madabegh region; the sewage irrigated zone. 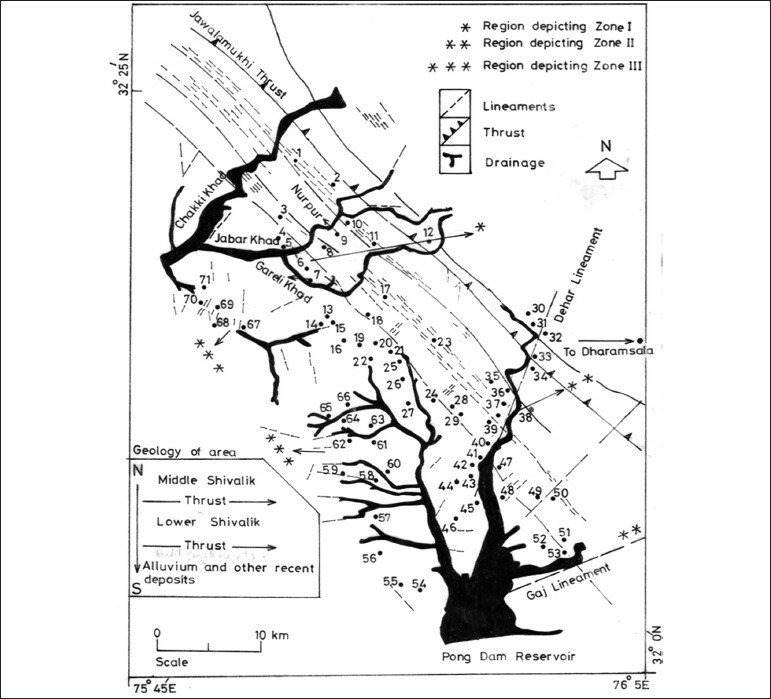 Whereas, the lowest ones was found in the not irrigated lands, which considered as a reference point of analyses. Conclusion: The maximum admitted concentrations of toxic heavy elements in the sensitive areas revealed to be exceed from three to thirty times than the non-irrigated zone. The cement industry is considered as one of the basic industries that plays a significant role in the national economy of developing countries. Activity concentration of 226 Ra, 232 Th, and 40 K in 38 samples of local cement types from different Yemeni factories has been measured by using the gamma ray spectrometry and their mean values were in the ranges (25.18-40.39 Bq/kg), (14.6-24.75 Bq/kg) and (160.01-596.38 Bq/kg), respectively. The average values obtained for 226 Ra, 232 Th, and 40 K activity concentration in different types of cement are lower than the corresponding global values reported in United Nation Scientific Committee on the Effect of Atomic Radiation publications. The obtained results show that the averages of radiation hazard parameters for all types of local cement in the current study are lower than the acceptable level of 370 Bq/kg for radium equivalent, 1 for level index (Iγ), the external hazard index ≤ 1 and (59 nGy/h) for absorbed dose rate. The measured activity concentrations for these natural radionuclides were compared to the reported data for other countries. Therefore, the natural radioactivity of cement samples under study was lower than the recommended values in the established standard and hence safe for use in building constructions. Effluent water from uranium mines, mill tailings ponds were studied for dissolved radionuclide. The concentration of uranium and 226 Ra in untreated effluent water was found to be elevated. The concentration of dissolved radionuclide in the adjacent aquatic streams and river were found to be of lower than the authorized prescribed limit provided by Indian regulatory agencies. The removal process of dissolved radionuclide in the effluent treatment plant is found to be effective with an average decontamination efficiency of >95% for both uranium and 226 Ra. 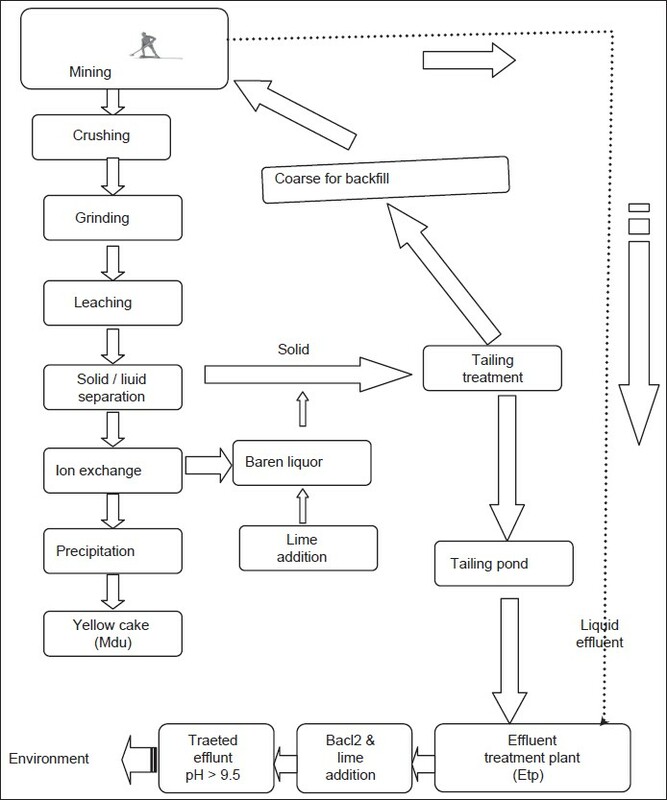 The uranium mining and ore processing activity has not significantly modified the aquatic environment due to effective effluent management system. The impact of gamma irradiation on Terminalia arjuna (T. arjuna), one of the potent medicinal plants for cardiac disease is described in this article. The seeds of T. arjuna were irradiated with different doses of gamma radiation ranging from 0 to 200 Gy using the 60 Co source. 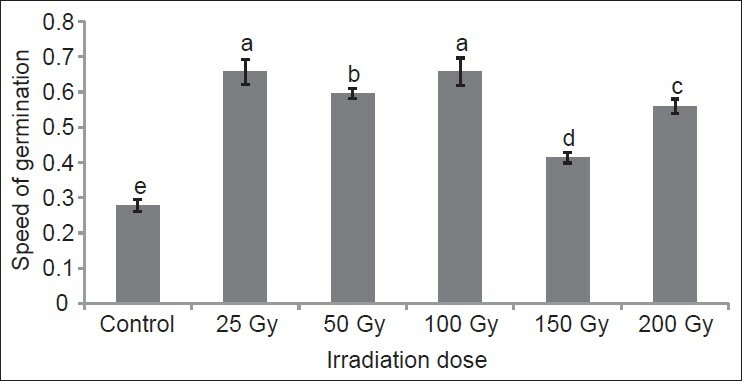 The effect of gamma radiation on the growth and biochemical constituents were compared with the control plants. Germination speed at 25 Gy was found to be 0.65, which was double compared to the un-irradiated seeds. An increase in germination percentage, vigor index, and relative growth rate, in terms of dry weight was noticed at lower doses of the radiation treatment. The proline content increased with increasing doses. The chlorophyll content was found to have increased to 12.2 mg/g FW at 100 Gy compared to the control level of 8.44 mg/g FW. Increased phenolic content and radical scavenging capacity was observed at 25 and 150 Gy. Hence, lower doses of radiation treatment may be used to increase the germination, growth, and vigor, and also the enhancement of plant metabolites like proline and phenolics in T. arjuna.